These Rawlings official Major League baseballs have been personally hand signed by Houston Astros rookie sensation George Springer. 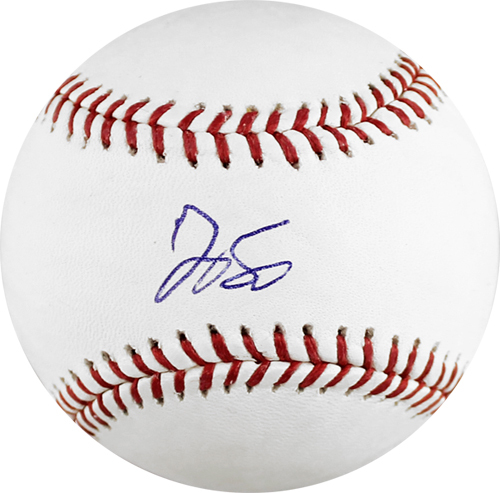 Each autographed baseball includes an individually numbered, tamper-evident TRISTAR Authentic numbered hologram, which can be verified online at www.tristarauthentic.com. George Springer, a First Team All-American at the University of Connecticut, was selected by the Houston Astros in the first round of the 2011 MLB Draft. In 2013 while in the Minors, he finished the season with 37 homers and 45 stolen bases, falling just shy of the first 40/40 Minor League season since 1956. He was named the MiLB Offensive Player of the Year by the MiLB.com staff. Springer made is Major League debut on April 16, 2014, and collected his first Major League hit in his second at-bat. On May 29th, he hit his 7th home run in 7 consecutive games, making him the first rookie to do so since 1937. Springer and the Astros got off to a great start in 2015, and are currently leading the pennant race.